Whatever happens in the midterms, the aftermath will be ugly. But the elections are nonetheless a fork in the road. If we take one path, it will offer at least a chance for political redemption, for recovering America’s democratic values. If we take the other, we’ll be on the road to autocracy, with no obvious way to get off. It’s a near-certainty that Democrats will receive more votes than Republicans, with polling suggesting a margin in votes cast for the House of Representatives of seven or more percentage points — which would make it the biggest landslide of modern times. However, gerrymandering and other factors have severely tilted the playing field, so that even this might not be enough to bring control of the chamber. And even if Democrats do climb that tilted slope, anyone expecting Republicans to accept the result with good grace hasn’t been paying attention. Remember, Donald Trump claimed — falsely, of course — that millions of immigrants voted illegally in an election he won. Imagine what he’ll say if he loses, and what his supporters will do in response. And if and when a Democratic House tries to exercise its powers, you can be sure it will be met with defiance, never mind what the Constitution says. But ugly as the scene will be if Democrats win, it will be far worse if they lose. In fact, it’s not hyperbole to say that if the G.O.P. holds the line on Tuesday, it may be the last even halfway fair elections we’ll ever have. Look at what’s happening in Georgia, where Brian Kemp — the Republican secretary of state, who oversees elections — is running for governor against Democrat Stacey Abrams. In any other democracy, letting a man supervise his own election would be inconceivable. But that’s how it is in Georgia, and Kemp is abusing his power to the max. A political party with any kind of commitment to democracy and fair play would treat Kemp as a pariah. Instead, he has the full support of the national G.O.P. And Georgia is far from unique. There have been similar if less spectacular attempts to rig the vote in Kansas and North Dakota, where would-be absentee voters were told that they had to use the right color ink — and were given conflicting information about what color was acceptable. The lesson we learn from all these abuses of power is that today’s Republicans are just like their fellow white nationalists in Hungary and Poland, who have maintained a democratic facade but have in reality established one-party authoritarian regimes. Everything we’ve seen says that Republicans will do anything they can to take and hold power, and Tuesday’s elections may be the last chance to stop them from locking in permanent rule. Oh, and in case you’re tempted to bothsides this: No, both sides don’t do it. Voting restrictions are almost entirely a Republican thing. As always, Democrats aren’t saints, but they appear to believe in democracy, while their opponents don’t. Democrats haven’t made the clear and present danger to democracy a central theme of their campaigns; they’ve been running mainly on health care instead. And it’s hard to fault their judgment. After all, health care is indeed on the line in these elections: Millions of Americans, especially but not only those with pre-existing conditions, will lose coverage if Republicans hold the House, because they’ll finally repeal the Affordable Care Act and will soon go after Medicare and Medicaid. [W]ith the crucial moment here, everyone should bear in mind what’s at stake. It’s not just tax cuts or health coverage, and anyone who votes based simply on those issues is missing the bigger story. 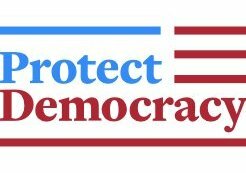 For the survival of American democracy is on the ballot. If you are registered to vote, be sure to do so and vote a straight Democrat ticket - even if you have to hold your nose to do so. It really is that critical.